Welcome to Israel, the most contested piece of real-estate in the world! As predicted, it happened here and it will happen here again! We arrived in Tel-Aviv, Israel today, just as the Israeli Shabbat was coming to a close. 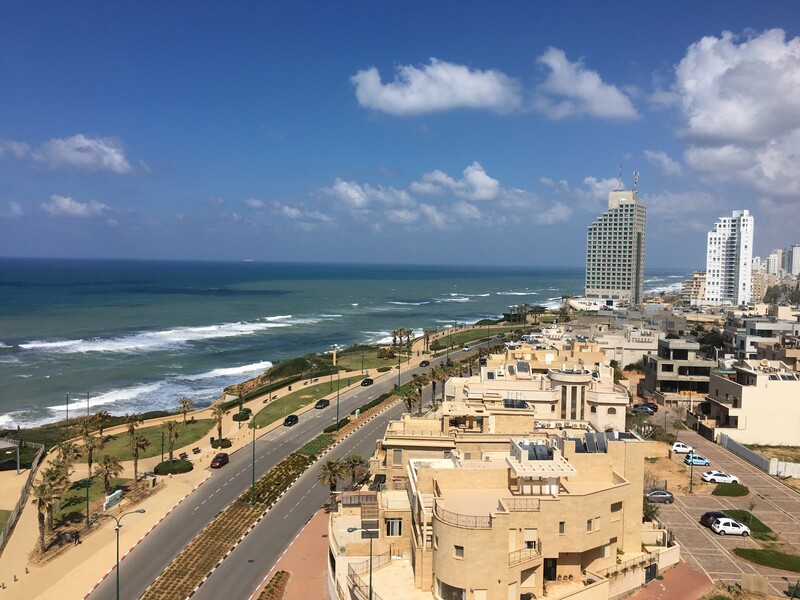 The name Tel- Aviv means “hill of spring” and refers to the birth of modern Israel, coming alive since its founding in 1948. And as we drive the streets of Tel-Aviv we can say, that indeed, Israel has come alive! Back in AD 636 unprovoked Arab armies conquered this land simply to expand the Muslim presence. In Jerusalem (where we shall be in about five days), the beautiful golden-domed building, the Dome of the Rock, was completed in about AD 691, built over the site of the two ancient demolished Jewish temples. The choice was deliberately intended to show the triumph of Islam over Judaism and Christianity. After 1400 years, it still stands, proudly dominating the ancient temple area. This clash of religions (and civilizations) is, of course, a continuing source of conflict. I will discuss this in more detail in a future report. For us, the land is special for one important reason: here Jesus was born, lived, taught and died on a hill outside of the city walls of Jerusalem. And here He rose again and ascended into heaven. And, God be thanked—He shall return here someday descending to the top of the Mount of Olives with His saints (Zechariah 14:3-4). The Son of God entered this small land (about the size of New Jersey) 2000 years ago, and it is to this land that He shall again return. For centuries His first coming was prophesied, and it happened just as predicted. His Glorious Return is also prophesied; and it shall happen, just as predicted. As we tour Israel we are walking on the most important piece of real estate on Earth. And someday when Jesus returns, we shall get the grand tour! I hope to file a report each day of our travels. I want to help you enjoy our tour, and with pictures and commentary, invite you to join us as we walk where Jesus walked—the very land to which He will return.